CBS Business Director Louise Seest kicks off CBS Business Connect 2018, 'Creating sustainable digital transformations'. Photo: Morten Madsen. 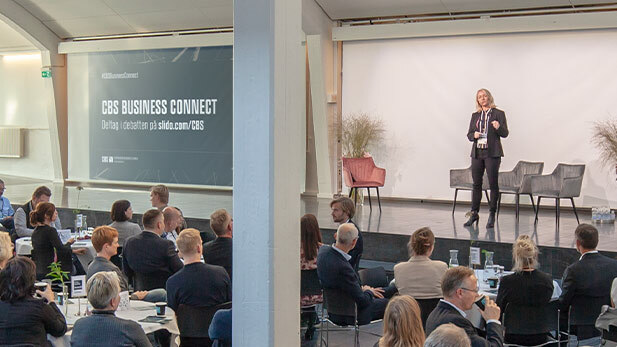 The CBS Business Connect event ‘Creating sustainable digital transformations’ drew a full house of about 500 participants. Students made up about a third of the audience with – in descending order – alumni, partner company representatives and CBS faculty making up the rest. Another take-away was the need to ensure educational core competencies as a solid fundament for handling the ever changing needs and circumstances that professional life after graduation are guaranteed to deliver. In addition, delivering on the need for flexible, relevant and lifelong learning was a wish from the audience and the panels to CBS. There were more take-aways; Leading digitalisation is so contextual a matter that it cannot be generalised about with any significance except for the fact that it will always demand serious reflection. Digitalisation will not lead to fewer jobs, just to different jobs as it does not simplify or rationalise anything but repetitive processes and actually brings more complexities. We, as a society, in the business world and politically, must become more agile if we want to abreast of demands and developments and shape things the way we want. Through the four-hour session the speakers and panel debaters managed to bring the subject matter all over the place, pointedly demonstrating that the digitalisation of just about all aspects of society and our lives makes the hunt for sustainable solutions very real and pertinent.